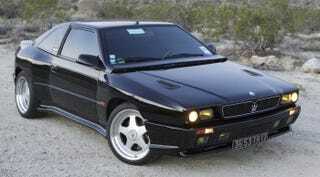 Remember the Maserati Shamal? We’re not surprised if you don’t. Launched in 1991, after Maserati pulled out of the States, it never officially came to the U.S. Today, there’s exactly one in the country, and in the June 2015 issue of Hemmings Sports & Exotic Car, we take a look at (and drive) that Maserati Shamal. Here’s how it came to the USA. But there’s a greater question at play here: How did it get here? (Anyone who says “by boat,” go to the back of the line.) There are considerable federal and state hurdles to import any car that’s less than 25 years old, and this Shamal’s owner, Roland Foss of Fullerton, California, jumped them all. How he made it happen applies to anyone looking to import a car into the States that wasn’t ever meant to be here. Now he tells us how he did it. The Shamal set sail on November 12, 2012. “Cost was $2,300 through Horizon—this was for the more inexpensive Ro-Ro shipping versus the more more expensive container option. Containers are safer, but there’s a greater risk of detainment, which gets super-expensive. Charges included ocean freight and all terminal charges, customers and agent broker fees on both sides, and importer filing on the U.S. side. “After a few weeks of wrangling, California DMV found a solution. They had me fill out a Statement of Facts (REG 256) attesting to the fact that I purchased the vehicle while a resident elsewhere, and that vehicle conformed to both EPA and DOT standards. They considered it a Direct Import Vehicle, which has specific meaning and allowances in the CVC (12.070).” So Roland’s Shamal is titled, but not registered—hence it’s still wearing its original French plates. You’d think that Roland would be keen to set up a P.O. box in Arizona or Nevada, or some other state with slightly less onerous motor vehicle regulations, and register his car in another state, but he has decided against that. “California vehicle code is pretty clear: If you live here and use the car here, you have to register the car here. Any sort of monkeying around would be an automatic loss of the car, and I’m not willing to do that. So, what this means is, I really only drive it about once a month.